The arid nature of Isinya would lead you to believe it’s practically impossible to even have a kitchen garden. Contrary to this, our customer in Isinya is an extremely happy farmer getting amazing profits from his farm all thanks to solar water pumping. It has been a year since the solar pumping system was installed in his farm which is approximately 3 acres, and as his farm manager explains, solar was a great investment. 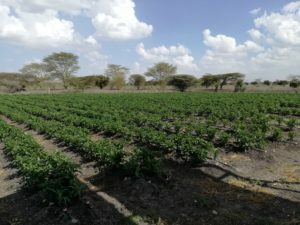 In the farm, they are growing fruits and vegetables and using drip irrigation they are able to water their crops consistently hence they can farm all year round without having to wait for the rainy season. For this reason, they also do crop rotation especially in the green house for the vegetables which have a good market. With water output of about 40,000 litres per day, this customer is also working on doing dairy farming which he is sure will go smoothly as he has a sustainable source of water. He has also put up four 10,000 litres water storage tanks which he uses to store water after pumping. Recently the weather patterns have not been reliable enough especially for farmers depending on rainy seasons for their crops to grow. 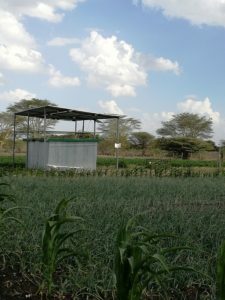 For this reason, having a solar pumping system for farmers would be something to consider especially having about 8-9 sun hours a day which is sufficient to provide enough water for a day. The other reason to consider solar is the cost efficiency. The initial capital may be higher than a conventional electric pumping system, however, solar has proven to have a payback period of between 12months to 24months. Thereafter you will have minimal or no running costs from water pumping, making your farming business even more profitable. 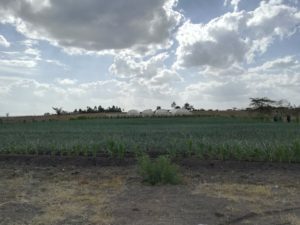 Based on the fact that most farms are located in areas where there is no grid connection, it is advisable and cheaper to use solar as it requires no transmission costs and is sustainable. Choose solar today and reduce your carbon footprint, save costs and have a sustainable source of power and water.